The Char Leger Renault FT, or FT-17 as it is more popularly known, was quite a remarkable vehicle for its day. Sadly for the brave warriors of France its “Day” was in 1918 and not 1940. Its early conception goes back to the fertile mind of Gen. Jean-Baptitste Eugene Estienne, a pioneer of early armored theory and development whom gets little acknowledgement in Anglo-Saxon histories of The Great War. The first two French tanks of World War One, the Schneider CA1 and the St. Chamond, were both unwieldy, huge vehicles along the lines of their British counterparts but even less reliable and practical. Gen. Estienne envisioned a smaller, more mobile tank that could be produced quickly and work well in conjunction with infantry assaults over broken ground. Despite Estienne’s endorsement, the tank almost did not enter production due to the desire to have yet another heavy tank in the French arsenal. 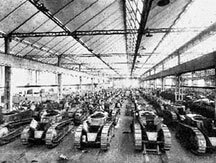 In the end the “Father of Tanks” got his way, with no small help from patriotic automobile industrialist Louis Renault and his talented design team. Even so, the project was slow and fewer than 100 models had been produced by the end of 1917. By the time of the armistice, however, well over 3,000 of the little tank had been produced (with about 500 delivered to the American Expeditionary Force). In between the world wars the FT-17 was a huge export item for France. Countries from Afghanistan to Ethiopia to Mongolia purchased the vehicles and the little tank saw action in the Russo-Polish War and Spanish Civil War, to name just two prominent conflicts. The vehicles were also produced under license in many countries. A French tank company in Somaliland, 1940. During the early 1930s, France updated the FT-17’s in her arsenal in several ways. New rubberized tracks increased cross country performance and the more efficient 7.5mm Chatellaunt replaced the Hotchkiss in 1931. There were also command versions with extensive antennae and a heavy version mounting a small 75mm howitzer. The latter was too short to be very effective, however. Some models even carried a spare MG (most often a Fusil Mitrailleur Mle 24/29) that could be utilized in an AA role. It was hardly practical since the commander had to lean out of the rear hatch to fire the machine gun skyward at incoming planes! When World War Two broke out, the French still had FT-17s in service and many more models in reserve. In all over 500 took part in 1940. Although some game systems over the years have allowed the cannon armed models, only machine gun carrying models were used by the French Army in 1940 and thus only they appear in 1940: The Fall of France. The heroic little warrior would fight on beyond that fateful year, seeing action in 1942-43 in North Africa and, sadly, in use by Nazi Germany for airfield defense and with its occupation forces across Europe. Swiss troops admire an FT-17's trench-crossing abilities. During the First World War the “Little Tank That Could” would succeed where its bigger brethren failed. Its light weight resulted in it being more mobile and versatile in a battlefield environment pockmarked with shell holes and mud. The FT-17 would be the first tank to use a compartmentalized engine in the rear and utilize a revolving turret; both of which became standard on tanks thereafter. Used by necessity in the Second World War it was little better than a mobile machine gun in a defensive role. Historical buffs can find FT-17s in military museums around the world, including the Patton Museum at Fort Knox, not too far from where I live. Don’t wait to put 1940: The Fall of France on your game table! Join the Gold Club and find out how to get it before anyone else!